The euro headed for its biggest monthly decline since May amid speculation the European Central Bank will extend its asset-purchase program as the Federal Reserve prepares to raise interest rates. Europe’s shared currency fell from the highest level in more than a week versus the dollar, extending an October slide that’s seen it weaken versus 11 of its 16 major peers. A global selloff in government bonds has pushed up yields, unlocking about $635 billion of debt for purchase via the ECB’s quantitative-easing plan. The slide in bonds means a boost in the number of securities yielding more than the ECB’s deposit rate of minus 0.4 percent, making them once again eligible for purchase under the institution’s 1.7 trillion-euro QE program. At the start of this month, almost a third of the securities in the Bloomberg Eurozone Sovereign Bond Index — or $2.2 trillion of debt — were off limits under QE, creating a supply crunch and fueling concern that the program wasn’t sustainable. The euro dropped 0.3 percent to $1.0955 at 6:55 a.m. in New York, extending its decline this month to 2.5 percent, and was little changed at 115 yen. 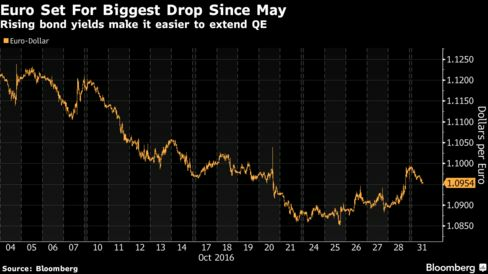 The 19-nation euro was undermined when ECB President Mario Draghi said Oct. 20 that officials didn’t talk about extending or tapering QE at this month’s policy meeting. Meanwhile, speculation intensified that the Fed will raise rates by December. The probability of a hike by year-end climbed to 69 percent, fed fund futures indicate, from 59 percent at the end of September. 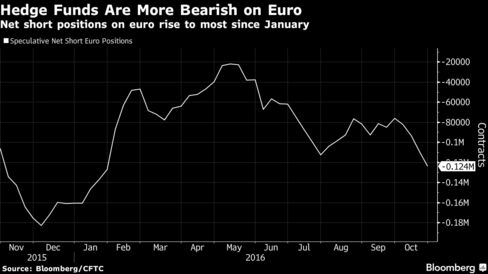 Hedge funds and other large speculators increased net bearish bets on the euro to 123,856 contracts in the week ended Oct. 25, the most since January, according to the Commodity Futures Trading Commission in Washington.